The photo below was taken in the 1900s. Local documents state that the land to build Hartshill school was donated by Molly Trye of Hartshill House, and that the house was owned by the Trye family up until the mid 20th century. Prior to the Tryes the house was owned by the Jees, in 1850 Richard Jee and his son Richard Robert were in residence, the Jee family were known as the local squires, going back to 1699. They also owned the local quarry. 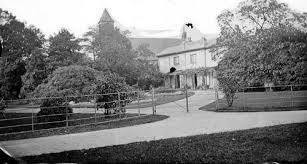 By the 1930s Hartshill House was a Sanatorium for people suffering from tuberculosis. Image and history courtesy of Sandra Noon, 2013.